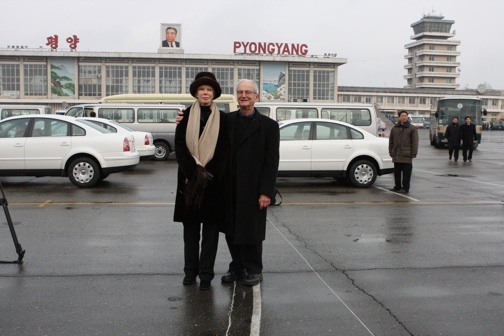 After months of anticipation, we landed 36 hours ago in Pyongyang, North Korea. The purpose? 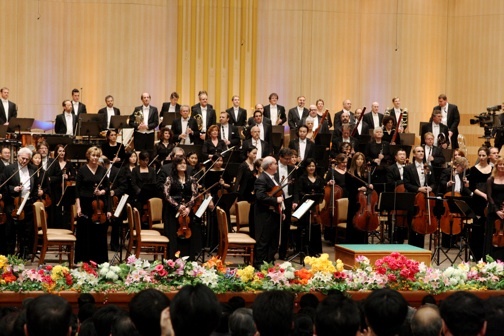 Ostensibly, to attend the New York Philharmonic concert at the invitation of the North Korean Ministry of Culture. But the real reason was to witness history. As to the concert, it was a stunning success - musically, emotionally, and politically. The invited audience heard one of the world's finest orchestras play at its highest level, and with an enthusiasm that one rarely experiences at its Lincoln Center subscription performances. Leading off with both nation's national anthems and concluding with a traditional folk song from Korea (North and South), the program evoked a surprisingly emotional response from both the audience and the orchestra. The normally non-demonstrative North Koreans stood up and gave the performers a prolonged ovation, and one then began waving their hands. The orchestra, in turn, which usually leaves the stage promptly, lingered on the stage and reciprocated by waving back at the audience. Now tell me, how many times have you seen that at a classical concert? As to the reaction of the board members and patrons in the audience, many a tear was shed. And a number of the musicians told us after at the gala dinner that they, too, were emotionally affected. It was a night to remember. Which leads us to the second issue: Will history also remember the night? Can a musical event have any influence on bringing together two nations that have no diplomatic relations have technically been at war since 1950? Can a concert conceivably have any impact on the six-party talks that are attempting to get North Korea to give up its nuclear weapons? We were encouraged by a discussion we had this evening with a high-level adviser to the talks who happened to attend both yesterday's inauguration of Lee Myung-bak as South Korea's new president and tonight's Philharmonic concert. He had three points to make. First, the parties are beginning to realize that it is likelier to reach an agreement in this final year of the Bush administration than to wait for a new president in 2009 to get up to speed on this exceedingly complex and delicate negotiation. This belief is predicated on the administration's renewed desire and preliminary efforts to make it happen. Second, President Lee's inaugural address was much more conciliatory toward North Korea than suggested by the conservative president's prior hawkish position. And finally, this observer said that what the talks need now are a tipping point, one that will be brought about by the opposing parties' reducing their distrust of each other. He feels the concert tonight could help bring about that reduction. The good will demonstrated by the North Korean government - they really pulled out all stops - and the support of our State Department could be meaningful harbingers. North Korea giving up nuclear arms? The U.S. and North Korea resuming diplomatic relations? Can it happen? Yes. Will it happen? To be continued. Meanwhile, back to our adventure in Pyongyang. The flight from Beijing lasted only one hour twelve minutes, but it took us into a different world. We flew in a chartered 747 (provided gratis by Asiana Airlines). There were 260 of us - the musicians from the New York Philharmonic, orchestra staff, board members, patrons, and 60 members of the world media with cameras and microphones at the ready. Arriving at Pyongyang airport was hard to describe. In one sense, it was terribly exciting. So few Americans have been here since the armistice of 1953 ended the Korean war. So little is known about the country and its people, given their choice to remain a closed society. So few North Koreans have been allowed to travel. The country, and its actions since 1950, have been a mystery to the Western world. And yet there was apprehension. We're still at war with North Korea; no peace treaty has been signed. It has the fourth largest standing army in the world, a country of just 23 or so million people. Much of the army is stationed within a short distance of the DMZ. As the plane came to a stop on the tarmac, the sight out the window was memorable. A large welcoming contingent was waiting. 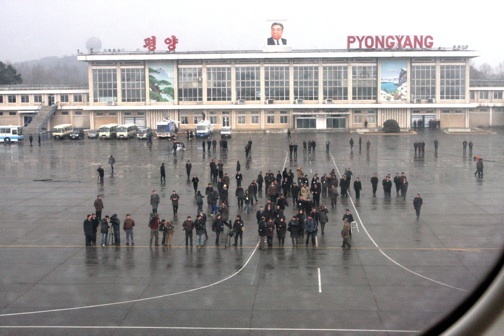 A sign said, "Pyongyang Airport." We were actually in North Korea. 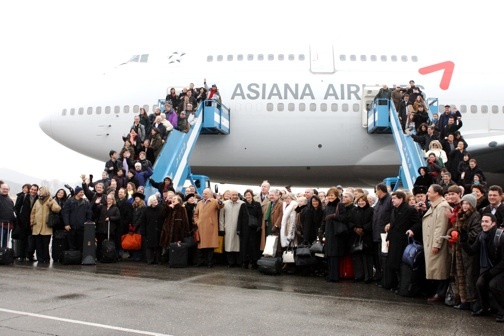 After we disembarked, there was a chaotic scene, with the local and international media competing for pictures and interviews with Maestro Loren Maazel and the musicians. Cameras and microphones were flying.. While at the airport, there was no incoming or outgoing aircraft traffic. Very few - probably only ten - planes were on the tarmac. It's not a very busy airport, to say the least.. It was surreal. About 30 minutes later, we boarded buses for the 20-minute trip to downtown Pyongyang and our hotel The drive to the hotel, with the roads virtually empty of vehicles and few people spotted along the way, was another surreal experience. In town, there was a little more activity, but not much. The hotel that the board members and patrons are staying in is adequate - maybe two or three stars - but functional. Warnings we heard the day before that occasionally the power or heat goes out have proved unfounded - so far. 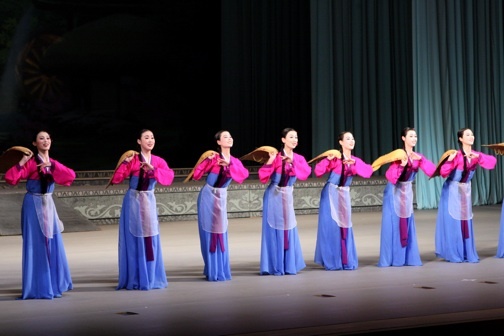 In the evening, we all attended a special concert of traditional Korean music and dance in a quite attractive modern hall. After that, we were treated to a fancy dinner (kimchi included, of course) in a grand ballroom. At each table were a few North Korean dignitaries, scholars, and unidentified others, all of whom spoke English, though to varying degrees. We were lucky at our table. We were able to have a remarkably frank two-hour-long discussion with our hosts on a wide variety of topics. It wasn't what we were led to expect. Also unexpected was the ability to photograph so freely. Although warned ahead of time by a Western diplomat posted in Pyongyang about their sensitivity to photographs, I was able to shoot freely with both my still and video cameras. And there was no problem bringing computers in. On the other hand, cell phones are a no-no, and were not allowed in. Today, we visited several sights that our hosts wanted to us to see. First was the giant bronze statue of Kim Il Sung that overlooks the city. Waiting for our arrival was a local TV crew, cameras at the ready. Before leaving the bus, our minders (who are with us 24x7) asked us to lay a wreath at the statue. We declined. A stand-off. No wreath, no getting off the bus to take close-up pictures. So we drove on to our next destination, the Grand People's Study House. Now this was a wondrous experience. The Study House has classroom after classroom filled with students studying, among other subjects, the written works of the Great Leader (Kim Il Sung) and the Dear Leader (Kim Jong Il). Thousands of volumes are claimed to have been written by them and are in the classrooms. During our visits to the classrooms, all the students were perfectly dressed, completely attentive to their teachers, and did not once look away from their teacher or their desk. Mind you, press and patrons were swarming all around them, and not one of them ever looked up at these people who were disrupting their classes. They looked robotic, Orwellian. Our third visit of interest was to the War Museum. Guess which war, and guess who started it. You may be unaware of the real facts, which we finally learned today, proving that it was the South Koreans and United States who invaded North Korea in 1950. And they have the documents to prove it! The primary displays were of captured and destroyed American arms from the war - artillery, tanks, aircraft, guns. Also prominent was the handwritten "confession" of the captain of the U.S.S. Pueblo, as well as a later "confession" of an American helicopter pilot captured in 1994. What struck me was that the key language in both confessions - made some 28 years apart - was word-for-word identical. What a coincidence! On the bus after the visit, my minder asked me what I thought of the museum. I told him that the museum's version of the start of the war sharply deviates from our view. He replied, "Our view is correct because we have the documents to prove it." All three of these sites had heavy youth attendance or participation. Therein lies one of the long-term problems in effecting any rapprochement with North Korea. Even if the Philharmonic visit helps build the first bridge to understanding, we still have the issue of dealing with a population that has been educated to follow a party line and has so little in common with our views of the world. A nine-hole golf course adjoins one of our hotels. A golf course in the Democratic People's Republic of Korea! Who woulda thunk it? Two of the orchestra members played a round today, light snow notwithstanding. And there's an 18-hole course an hour or so away. We traveled one stop on the Metro. The main highlight was the escalator access - it must be one of the longest anywhere. Otherwise, a Metro's a Metro. We drove by a major department store, one with the imaginative name of "Department Store Number 1." 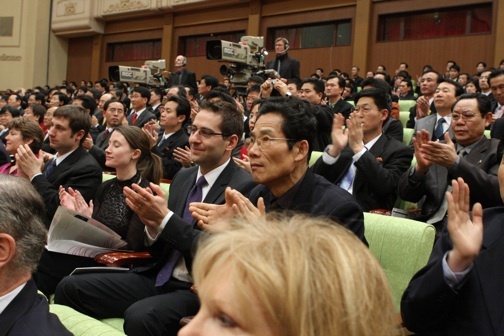 Virtually every male North Korean we met sported a Kim Il sung lapel pin on a black suit with a white shirt. Every one. There are not a lot of lights on at night. It is very dark driving around town after dark in both commercial and residential districts. There are very few traffic lights at intersections to regulate the few cars on the road. There are, however, a multitude of attractive female traffic directors who stand in a small circle at key intersections to do manage the traffic flow. And they do it with precision arm movements that are a delight to watch.